zoster ophthalmicus at different stages of evolution (fresh and crusted vesicles) in the ophthalmic division of the trigeminal nerve. Treatment with antivirals can dramatically reduce the symptoms. Is orbital pigmentation present? 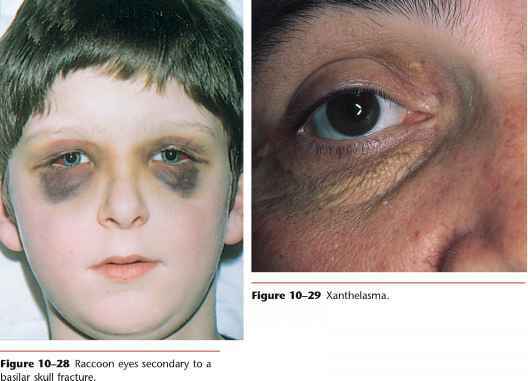 Orbital pigmentation, also known as raccoon eyes, is an important sign of a basilar skull fracture. This discoloration is caused by extravasated blood from the fracture of the base of the brain. This is an important sign to recognize, especially in an unconscious patient, when a history is not available. Figure 10-28 shows a patient with a basilar skull fracture. Notice also the subconjunctival hemorrhages on the lateral aspects. Inspect the eyelids for xanthelasma. Although not specific for hypercholesterolemia, these yellowish plaques are commonly associated with lipid abnormalities and are caused by lipid deposition in the periorbital skin. Xanthelasma is shown in Figure 10-29. A stye, or acute hordeolum, is a localized abscess in an eyelash follicle and is caused by a staphylococcal infection. It is a painful, red infection that looks like a pimple pointing on the lid margin. Figure 10-30 depicts a stye. Blepharitis is a chronic inflammation of the eyelid margins. The most common form is associated with small white scales around the lid margin and the eyelashes, which stick together and may fall out. 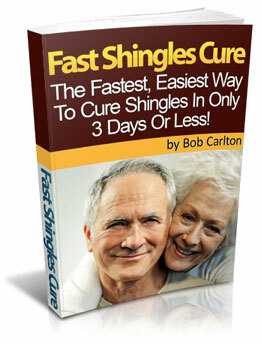 There are several annoying symptoms: itching, tearing, and redness. 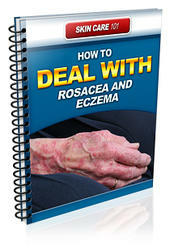 The condition is frequently associated with seborrhe-ic dermatitis. Figure 10-31 shows blepharitis. Figure 10-27 Herpes zoster ophthalmicus. basal cell type. The remaining 5% consist of squamous cell carcinomas and meibomian gland carcinomas. Figure 10-32 shows a basal cell carcinoma of the lower lid, the more common location. The lesion begins growing slowly and painlessly, eventually forming the typical rodent ulcer with a raised border and an indurated base. The tumor erodes the surrounding area, forming the ulcer. Note the raised border of the lesion in Figure 10-32. Squamous cell carcinomas, which tend to be on the upper eyelid, grow faster than basal cell carcinomas. Early ulceration is common. 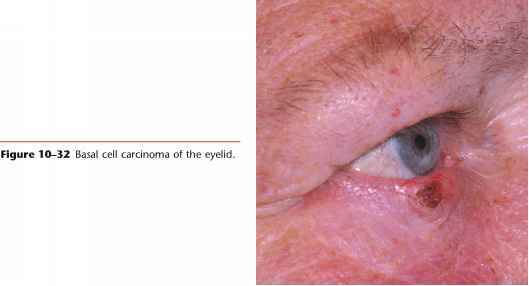 A squamous cell carcinoma of the eyelid is shown in Figure 10-33. The base and edges of the ulcer are hard and hyperemic. The most common ocular manifestation of AIDS affecting the eyelids is lesions of Kaposi's sarcoma. The initial manifestation may be subtle and may be mistaken for blepharitis or a chalazion. 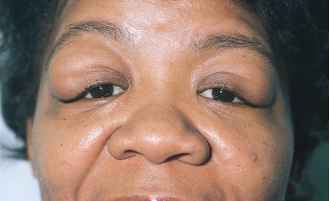 Refer to Figure 8-93C, which shows a patient with AIDS and Kaposi's sarcoma of the eyelid. Figure 10-34 Bilateral lacrimal gland enlargement. Note the classic sigmoid shape of the eyelids. In general, there is little to be seen of the lacrimal apparatus, with the exception of the punc-tum. If tearing, also known as epiphora, is present, there may be some obstruction to flow through the punctum. If excessive moisture is present, check for a blockage of the nasolacrimal duct by pressing the lacrimal sac gently against the inner orbital rim. If a blockage is present, material may be expressed through the punctum. Figure 10-34 shows massive lacrimal gland enlargement as a result of sarcoidosis. Figure 10-35 shows marked bilateral proptosis of the globe in a patient with hyperthyroid-ism. Note the massive lacrimal gland enlargement. Dacryocystitis is a term describing the inflammation of the lower lacrimal passages usually seen in infants or older individuals. The causes include congenital anomalies, infection, and stenosis of the lacrimal duct. Chronic dacryocystitis, seen in Figure 10-36, is a common disorder and almost always arises secondary to ductal obstruction. Both conjunctivae should be examined for signs of inflammation (i.e., injection, or dilatation of its blood vessels), pallor, unusual pigmentation, swelling, masses, and hemorrhage. The tarsal conjunctiva may be seen by everting the eyelid. Ask the patient to keep the eyes open and look downward. Grasp gently some of the eyelashes of the upper lid. Pull the eyelid away from the globe, and press the tip of an applicator stick against the upper border of the tarsal plate. Then quickly turn the tarsal plate over the applicator stick, using it as a fulcrum. Your thumb can now be used for holding the everted lid, and the applicator stick can be removed. After inspection of the tarsal conjunctiva, have the patient look up to return the lid to its normal position. Figure 10-35 Hyperthyroidism. Note proptosis and lacrimal gland enlargement. The normal conjunctiva is transparent. Note the number of blood vessels. Normally, only a small number of vessels are seen. Ask the patient to look up, while you pull down on the lower eyelids. Compare the vascularity in the two eyes. Conjunctivitis is the most common of all eye diseases in the Western hemisphere. The causes are numerous: bacterial, viral, chlamydial, fungal, parasitic, spirochetal, allergic, traumatic, chemical, and idiopathic. Bacterial conjunctivitis is the most frequent type and is self-limited, lasting 10 to 14 days. Figure 10-37 shows acute hemorrhagic conjunctivitis. This highly contagious ocular infection, often bilateral, is caused by the enteroviruses (members of the picornavirus family), Pneumococcus organisms, and Haemophilus influenzae. Giant papillary conjunctivitis is an ocular syndrome consisting of excessive secretion of conjunctival mucus, itching, and the development of giant papillae (1 mm or more in diameter) on the tarsal conjunctiva. This syndrome occurs mostly in patients who wear soft contact lenses, but it can occur in patients with ocular prostheses or other foreign bodies in the eye. Figure 10-38 shows a patient with giant papillary conjunctivitis. Figure 10-39 shows a large subconjunctival hemorrhage. This common condition may occur spontaneously, usually in only one eye, in any age group. Because of its sudden appearance and bright red color, the patient may become alarmed. The hemorrhage is usually caused by a rupture of a small conjunctival vessel after a bout of severe coughing or sneezing. 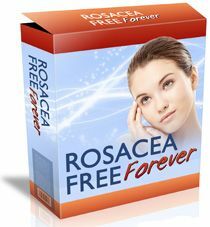 There is no treatment, and the hemorrhage resolves within 1 to 2 weeks. Figure 10-38 Giant papillary conjunctivitis. secondary to hay fever. An example of hemorrhagic chemosis is pictured in Figure 10-41. The patient, a 42-year-old man, had a 10-year history of progressive proptosis secondary to a melanoma. Two common benign growths on the conjunctiva are the pinguecula and pterygium. A pinguecula is a whitish-yellow, triangular, nodular growth on the bulbar conjunctiva adjacent to the corneal-scleral junction (limbus), as seen in Figure 10-42; it does not cross on to the cornea. A pterygium is a more vascular growth on the bulbar conjunctiva that begins at the medial canthus and extends beyond the corneal-scleral junction to the cornea. This typically triangle-shaped fibrovascular connective tissue may cause astigmatism or even decreased vision if it extends toward or occludes the pupillary margin. The cause of the pterygium is thought to be chronic dry eyes, because its frequency is higher among people living near the equator. 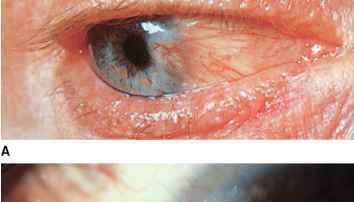 Figure 10-43A shows a pterygium;Figure 10-43B is a close-up photograph of a pterygium in another patient. Notice the vascularity and their positions across the limbus. Primary acquired melanosis is a unilateral condition in which melanotic pigmentation develops in the conjunctival or corneal epithelium. It starts insidiously during middle age. A biopsy is often needed to rule out a malignant melanoma. Figure 10-44 shows primary acquired melanosis. Primary acquired melanosis of the plica semilunaris in another patient is seen in Figure 10-45. A benign pigmented tumor of the conjunctiva may be a conjunctival nevus. This is a solitary, well-defined, slightly elevated lesion that moves freely over the globe. Nevi have a predilection for the limbus, plica semilunaris, caruncle, and lid margin. Most nevi are tan or brown, and many have zones of clearing within known as lacunae. Figure 10-46 shows a conjunctival nevus. A dermolipoma of the conjunctiva is a common congenital tumor, often bilateral, that usually appears as a smoothly rounded growth in the superotemporal quadrant of the bulbar conjunctiva near the lateral canthus. Figure 10-47A shows bilateral dermolipomas of the conjunctiva. A close-up of the lesion in the right eye is shown in Figure 10-47B. The yellowish color is secondary to the increased fatty deposits in the lesion. Often, fine hairs may protrude from its surface. Treatment is usually not indicated. The sclera is examined for nodules, hyperemia, and discoloration. The normal sclera is white. In dark-skinned individuals, the sclera may be slightly brownish in color due to pigment migration. Jaundice, or icterus, is a yellowish discoloration of the sclera, skin, and mucous membranes and is caused by retention of bilirubin or its products of metabolism. Jaundice is more easily seen in the sclera of white individuals and may be missed in people of color or in dim light. Carotene may also cause yellowing of the skin but not of the sclera (see Fig. 17-5). The sclera may appear bluish, normally in infants or pathologically in osteogenesis imperfecta. Osteogenesis imperfecta is a group of hereditary disorders with bone fragility. Individuals with these disorders may suffer bone fractures after mild trauma. The autosomal dominant form is most widely recognized. In this form, the sclerae are very thin and take on a blue hue because the uveal pigment shows through the sclera. Deafness is also seen in this form of the disorder. Figure 10-48 shows blue sclerae in a patient with osteogenesis imperfecta. Pterygium. B, A close-up view. subconjunctival and yet superficial to the underlying sclera. The affected area may be either flat and diffuse or localized and nodular (1 to 4 mm in diameter). Although the cause in most cases is unclear, episcleritis also occurs in patients with inflammatory bowel disease, herpes zoster, collagen vascular disease, gout, syphilis, and rheumatoid arthritis. Figure 10-49 shows the classic features of episcleritis. Figure 10-45 Primary acquired melanosis.